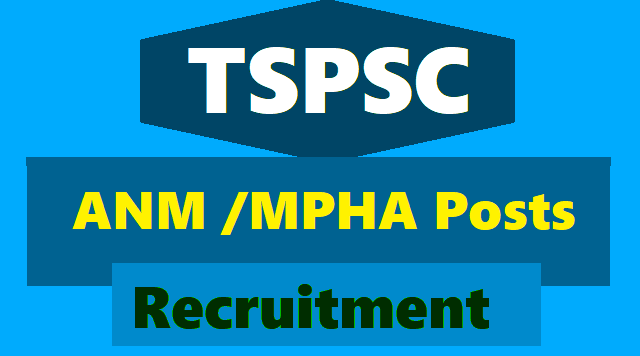 TSPSC ANM /MPHA (F) Posts Answer Key, Results 2018 at tspsc.gov.in: TSPSC ANM /MPHA (F) Recruitment Hall tickets 2018, TSPSC ANM /MPHA (F) Posts Recruitment Exam date 2018, 152 ANM/ MPHA (F) Posts in TVVP, TSPSC MPHA Posts Recruitment, TSPSC ANM Posts Recruiment : Telangana State Public Service Commission (TSPSC), Hyderabad issued TSPSC ANM/ MPHA (F) Recruitment 2018 Notification (Advt. No. 05/2018) for the recruitment of 152 Auxiliary Nurse Midwife (ANM)/ Multi Purpose Health Assistant (MPHA) Female posts in Telangana Vaidya Vidhana Parishad (TVVP), Telangana State. Eligible candidates can apply online through tspsc.gov.in from 29.01.2018 to 28.02.2018. HALL TICKETS: (TSPSC ANM /MPHA (F) Posts Recruitment 2018 Hall tickets) Hall tickets can be downloaded 7 days before commencement of Examination. c) Must have registered with the AP/ Telangana Nursing Council. Eligible candidates can apply online through tspsc.gov.in from 29.01.2018 to 28.02.2018. Candidates should complete the OTR process before applying online. Candidates required to pay Rs. 200/- towards Application Processing Fee and Rs. 80/- towards Examination Fee. SC/ ST/ BC/ Unemployed applicants, PwD, Ex-SM candidates are exempted from payment of Examination Fee. Selection will be made through Written Test (70% weightage) and Govt. Service Experience (30% weightage).